This is the first year the Ariel Re Bermuda Intl 7s tournament has welcomed high school girls and collegiate women's teams to compete on the island next March. To date AIC, Colgate, Humber, Ithaca, Kutztown, Ohio Wesleyan and the US Naval Academy have all expressed serious interest in traveling to Bermuda to compete. American International College Women's Rugby has competed as a varsity program since 2015. The Yellow Jackets are lead by head coach Peter Lang. AIC finished their 2017 regular season at 3-6. As one of the better-supported collegiate rugby programs in the country, AIC rugby offers scholarships for domestic and international students and employs a full-time coach. 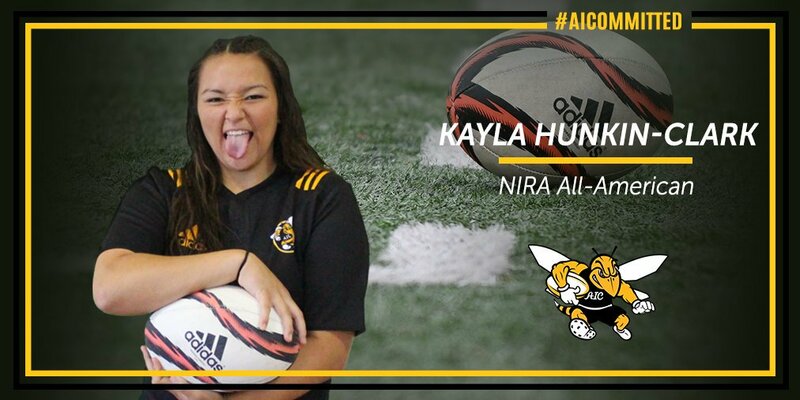 Rugby is one of two sports in which AIC participates in Division I. The AIC home pitch is located on campus at the Ronald J. Abdow Field in Springfield, Massachusetts. The National Intercollegiate Rugby Association (NIRA) coaches announced the league's All-American honorees on Tuesday, December 12 following the Fall 15's season. Three members of the American International College women's rugby team received First Team honors: Senior captain Kayla Hunkin-Clark, Senior captain Bridget Kahele and Freshman Siale Alatini. Hunkin-Clark lead the team with 13 tries this year, including a five-try game against Notre Dame College on senior night on October 12. Kahele also had three tries during the 2017 season. Both were previously named USA Rugby All-American Honorable Mentions this season; additionally, both were named NIRA All-Americans in 2016. Rounding out the Yellow Jackets' All-American selections was Alanti, who found the try zone seven times in her outstanding rookie season.